A serial online business entrepreneur, Thomas turned his passion for growing and selling online businesses into a full-time career when he founded FE International in 2010. Since then, he has overseen the successful sale of hundreds of millions of dollars in deal transactions for SaaS, e-commerce and content-based businesses. Optimal mobile experiences are increasingly critical to an e-commerce business's success. What steps should these businesses be taking to ensure success in mobile? Mobile has overtaken all other devices as the means by which consumers spend the most time online. Despite that, e-commerce conversion rates on mobile remain up to four times less than what they are on a desktop. It is speculated that consumers use their mobile devices for researching products and services, but when it comes time to purchase, they prefer to use a desktop. 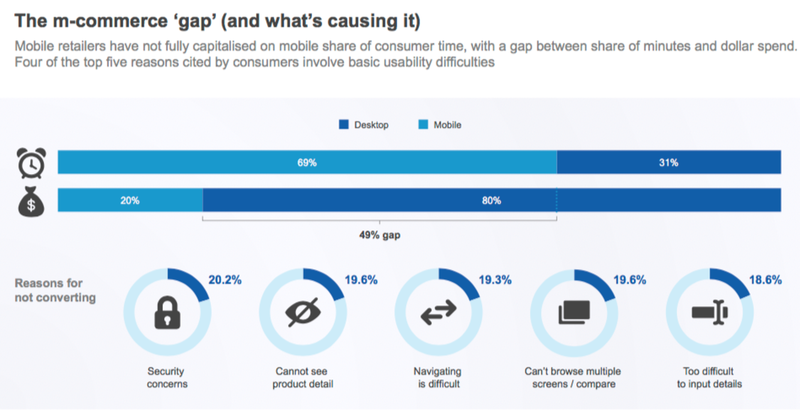 While that may be true, studies such as the one in the graphic above have shown that all but one of the main reasons consumers give for not converting on mobile comes down to usability issues. If you’re an e-commerce business owner, it’s crucial to ask yourself: what steps can you take to make sure you’re not losing out on sales because of poor mobile performance? Employing responsive website design is one very effective way to tackle mobile usability issues. Non-responsive websites render very poorly on mobile devices, and it’s no wonder. After all, the screen on a smartphone has a completely different size, aspect ratio, etc. to the screen of a desktop. A responsive website detects the size of the device on which it’s being viewed and adjusts the design and layout accordingly. It’s important to note that there’s a big difference between a responsive website and a “mobile-friendly” one. Mobile-friendly sites retain the layout of the desktop site and simply shrink to fit the screen of the mobile device. This necessitates a lot of zooming in and out which is hardly conducive to a pleasant online shopping experience. Despite the fact that all of the major e-commerce platforms now offer responsive themes, an overwhelming majority of small businesses do not have responsive websites. If you count yourself amongst them, upgrading to a responsive site will have a dramatic effect on your mobile performance. Another way to dramatically increase performance on both desktop and mobile is to employ a Content Delivery Network (CDN). While many online business owners know the importance of optimizing image and video size and the substantial improvement this can have on page load times, a good CDN can really supercharge your performance. Cloudinary makes it easy to integrate best-in-class content delivery into your website. If your website is heavily dependent on the use of images and video, as most e-commerce sites are, using Cloudinary can help make the difference between closing a sale and losing one. How do you assess value when you're looking at an online business? ● Length of time in business: Generally speaking, 12 months is the minimum amount of history of the business required. This is especially true of e-commerce sites as we require sufficient history to evaluate any seasonal spikes and dips. ● Level of owner involvement: Most website buyers are looking for passive income. If the owner spends more than 20 hours a week operating the business, or there is specialized technical knowledge required, look at ways to decrease both. ● Solid financials: It’s a given that any reputable buyer will insist on detailed and verifiable financials. ● Traffic: Detailed reporting on where you derive your website traffic from is a prerequisite for achieving a positive valuation. If your traffic comes primarily from organic search, how vulnerable is your business to search algorithm changes? If your traffic comes from paid search, what keywords do you rank for and how much competition is there for them? No matter what platform you build your e-commerce store on, try to extract as much data as possible from how customers behave when interacting with your site. ● Branding: In an e-commerce ecosystem of intense competition, where it’s ever harder to compete on price, having a strong brand is becoming increasingly important. Demonstrable customer loyalty, either through stellar reviews with a high percentage of repeat clients or an avid social media following, will be attractive to buyers. Looking ahead, what new technologies are set to make the biggest impact in the near term and which look promising but are still 5-10 years out in your estimation? In the near term, Internet of Things (IoT) technology will begin to have an even greater impact on our lives. Most of us are already well acquainted with Siri and Alexa. With security concerns being allayed through the incorporation of blockchain technology, IoT has the potential to transform the way we live (through home automation), our health (through wearable tech), and in many ways yet to be determined. Expect explosive growth in this area, as consumers look to further simplify and systematize their day-to-day. While there has been ever more talk about Artificial Intelligence (AI) of late, it is likely five to ten years before technologies like self-driving cars revolutionize our everyday lives. While AI increasingly powers some of the most exciting and potentially transformative tech out there, its ubiquity is still several years away. How can an online business owner improve the value of their online business? This may sound counterintuitive, but I often advise business owners that the best way to improve the value of their online business are the same steps required to prepare it for an eventual exit. Implementing the processes buyers look for in a business well before (say, a year) seeking an exit can make the business much more valuable. ● Limit owner involvement - If you find yourself spending more than 20 hours a week running your business, it will result in a lower valuation for your business and make it more difficult to sell. Not only that, it impacts your quality of life and the time you have available to develop other projects. Finding ways to decrease the number of hours you spend running your business through streamlining your processes, outsourcing, etc. is good practice no matter where you are in your business journey. ● Keep solid records - The importance of keeping solid records, from the beginning, cannot be overstated. Not only will verifiable financials and traffic analytics be an integral component of a successful exit, they are also vital to your success right from the start. If you’re not measuring and recording your results, how can you take appropriate steps to improve your business? ● Build a standalone brand - Branding entails much more than just a nice logo. Certain desired associations with your brand will often be the primary factors consumers use to distinguish your business from your competitors. Resist the temptation to build a brand that identifies too closely with its owner. A standalone brand that finds traction with consumers is infinitely more easily transferable to new ownership and therefore increases the value of an online business as well as the probability of a successful sale. ● Market smart - High quality, relevant content that drives organic search is a potent tool in any marketing toolkit. So is a healthy email list populated with engaged subscribers. Driving sales with a well thought out and executed content marketing strategy is a must for any successful online business. If you find that content creation is taking up too much of your time, this is one area where you can outsource to a talented agency.